to put a spotlight on the importance of women holding positions of leadership and influence in technology. The event sponsors included Microsoft, Google, Facebook, Stripe, Science Foundation Ireland and SAP. The conference was split into panels addressing diversity in the technology sector with a focus on software engineering, cybersecurity, data science, AI, and inclusive design. There was also a Careers & Future of Work session and a Maker Workshop along with ample networking opportunities. The event was attended by Paula Roberts, Assistant Professor from the School of Computer Science and Statistics together with Sinead McAleer and Ekterina Lait , JS Computer Science and Business students who were nominated to attend. All pictured above. "It was a great honour to get the opportunity to attend the first Anita B.org Grace Hopper event to be held outside of the United States. This event calls on the entire technological community to question "What would life be like if technology had a workforce that was 50% male and 50% female." 25 years ago, technologist Anita Borg spoke at the first ever Grace Hopper event in Washington. She challenged the audience, made up of professional computer scientists and engineers, to share a collective goal of making the technical workforce "50/50 by 2020." Since then, the conversation has continued and through decades of technical innovation and progress - this is still a problem that computer scientists are yet to solve. During the event, there was a large focus on how giving minorities a seat at the table in technology is a win-win-win. Primarily, hiring diversely and equitably should be a top priority for technology employers. Secondly, more inclusion of minorities in development leads to better and more accurate technology. "It was an absolute pleasure to have had the opportunity to attend such a wonderful event. The Ainta B.org Hopper Local was eye-opening and illuminating not only because of the phenomenal speakers but because of the conversation that went on in between. The Hopper Local was a platform for me to meet and network with women across industries and from countries that would not have been possible in any other environment. It brought home to me the importance of events like these for women within the tech industry which, to this day, is nowhere near a 50-50 male to female split. This sentiment was echoed throughout the day but held particular gravity during the Careers & the Future of Work talk. During this, the panellists talked in detail of the struggles they encountered and the journeys that brought them to where they are today. Paula Roberts added, “This immersive event brings women technologists at all levels together, along with members from industry, leading companies, academia, and research, to build relationships, learn and advance their careers. 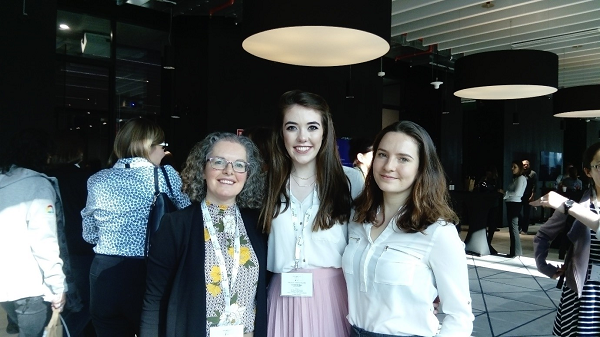 Tickets were expensive and limited and so I was delighted to be invited by Microsoft not only to attend this inaugural event but also to nominate Ekaterina and Sinead for student tickets”.